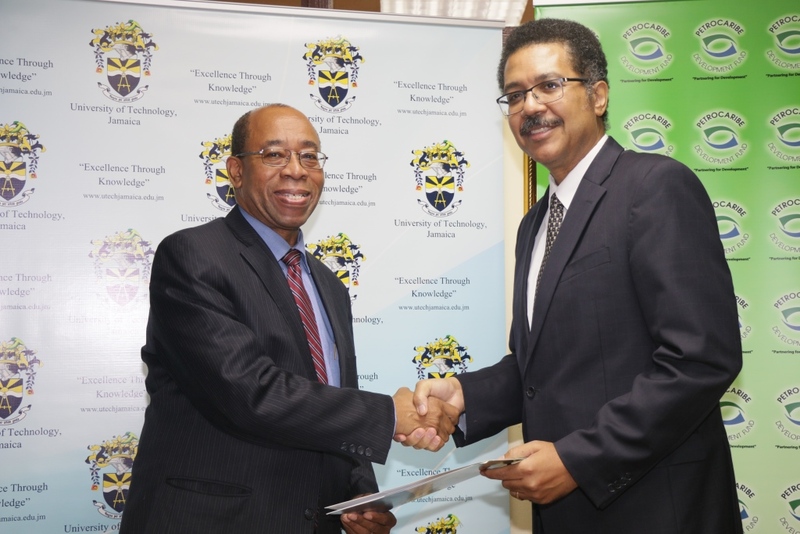 UTech, Jamaica signs Contract Agreement with PetroCaribe Development Fund for Renewable Energy Training Project at Glenmuir High School — UTech, Ja. Prof. Stephen Vasciannie, CD, (seated 3rd left) President, University of Technology, Jamaica and Dr. Wesley Hughes, CD., JP (seated 2nd left) Chief Executive Officer, PetroCaribe Development Fund at the signing of a contract agreement between the PetroCaribe Development Fund (PCDF) and the University of Technology, Jamaica for the implementation of a renewable energy training Project at Glenmuir High School, Clarendon. Also sharing the moment are Shakierah Cowan (seated left), Client Relations Manager, PCDF, and Prof. Nilza Aples (seated right) Dean, Faculty of Engineering and Computing, UTech, Jamaica. Standing from left are Sheena Woodburn, Research Assistant, PetroCaribe Development Fund, Dr. Therese Chambers, Lecturer, School of Engineering and member of the Project team, Kirkland Rowe, Lecturer, School of Engineering and member of the Project team, Elecia Johnson, Administrator for the Project, UTech, Jamaica, and Martin Henry, Manager, Projects and Operations, School of Graduate Studies, Research and Entrepreneurship, UTech, Jamaica. 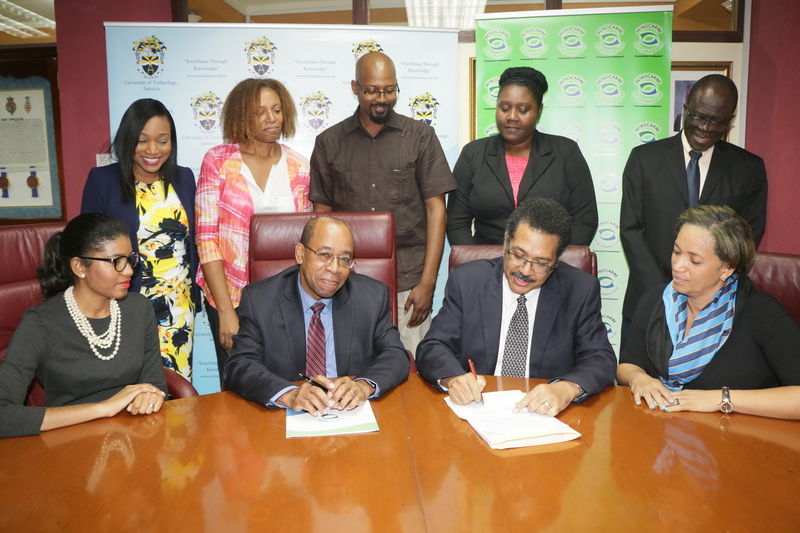 The University of Technology, Jamaica (UTech, Jamaica) and the PetroCaribe Development Fund (PCDF) on Tuesday, February 14, 2017 formalized collaborative arrangements under which the University has been contracted by the PCDF to implement a renewable energy training pilot project at the Glenmuir High School in Clarendon. The pilot project is for a period of four months and involves installation of a solar energy system and other infrastructural modifications, as well as a training component which will guide the teachers and students about best practices in energy management and efficiency. UTech, Jamaica led by expertise in its School of Engineering, was selected by the PCDF to undertake the training component involving the training of teachers and students on energy management and efficiency. The Project comes as part of the thrust by the University to provide consultancy services from the professional expertise of its staff to a growing number of clients in the public and private sector in Jamaica and across the Caribbean. Dr. Hughes noted that Glenmuir High School was selected for the pilot project “primarily because the school demonstrated the capacity consistent with the project requirements.” He added that the intention is to replicate the project in other high schools across Jamaica after the pilot is tested at Glenmuir. Dean of the Faculty of Engineering and Computing, Dr. Nilza Aples noted that UTech, Jamaica’s expertise in engineering education and training is well established having led a number of similar energy training projects with other local and international organisations and welcomed the continued opportunity to contribute to Jamaica’s energy development. Following the Glenmuir High School Pilot Project, the PetroCaribe Development Fund intends to roll out the programme for renewable energy use across many other schools in the country. In the Estimates of Expenditure for the new financial year, 2017/18, the Government has allocated $695 M for energy efficiency and energy conservation in the public sector. Prof. Stephen Vasciannie, CD, (right) President, University of Technology, Jamaica and Dr. Wesley Hughes, Chief Executive Officer, PetroCaribe Development Fund (PCDF) seal the deal with a handshake following the signing of a contract agreement with the PCDF for the University to implement a renewable energy training Project at Glenmuir High School, Clarendon. The contract signing took place at the UTech, Ja. Papine campus on Tuesday, February 14, 2017.